Popular television serials make much of the fact that Akbar was illiterate; a term used recently was “j?hil unpa?h” (ignorant and illiterate). True, all early attempts to teach Akbar how to read and write failed. The historian Andre Wink describes the many attempts made to formally educate him. As one story goes, the astrologically auspicious hour to begin instruction had been set at the exact moment the prince turned four years, four months, four days old. Akbar, however, never turned up. His tutors failed spectacularly, or else taught him other skills. One imparted to him the taste for pigeon-flying. Another did his best and then went off to Mecca, presumably to expiate for his utter failure in educating a future ruler. His father Humayun, hoping to be of some encouragement, sent him Persian verses he had composed, but Akbar remained disinterested. But while he evidently failed to learn to read and write, Akbar, like all Mughal Princes, knew languages such as Turkic, Persian and was instructed in the manners and customs of Hindustan. He underwent instruction in the liberal arts as well, for instance, taking drawing lessons from the Persian masters and was skilled in crafts such as carpentry. Moreover, like all princes, Akbar received martial training from a very early age and assumed military command quite early as well. As a future ruler, he also imbibed the virtues of caution and the need to be equable under all circumstances. Abu al-Fazl ibn-Mubarak, nobleman and devoted friend, who was also Akbar’s biographer, notes in the Akbarnamah how Akbar arrived at his judgments on cases brought before him, keeping in mind not just what the laws ordained but also eyewitness accounts, his own assessment of the information, and aspects like circumstance and physiognomy. As for his sons, their rigorous instruction regime remained uninterrupted even by travel or their long campaigns. Mughal princesses such as Gulbadan, Humayun’s sister, received formal literary education from especially appointed matrons. Akbar’s “illiteracy” wasn’t really unusual for its times. As Wink suggests, kings of medieval Europe were aided by scribes and officials. There are other theories too accounting for Akbar’s lack of scholastic attitude in his childhood. Ellen Smart in her 1981 essay makes the case that Akbar may have been dyslexic, though there is little evidence or corroborating facts in support of this. Annemarie Schimmel suggests that the word “ummi” sometimes used to describe Akbar is ascribed a different meaning in the Koran: an inspired mystic, or someone whose knowledge is divinely given and not taught. Abu al-Fazl, in far too cloying terms, described Akbar as having “ilm laduni” (knowledge directly from god). The Portuguese Jesuit priest and traveller Antonio Monserrate described Akbar as a man of “excellent judgement” and “good memory”, whose learning had been greatly accentuated by his ability to listen to others. In his own memoirs, Jahangir wrote that his father conversed, debated and associated with men of knowledge of every religion, especially with the learned and the pundits of the land and thus much became clear to him through this exchange with the wise. During Akbar’s fifteen years at Sikri, religious debates were held every Thursday at the Ibadat Khana of Fatehpur Sikri. A lot has been written on Akbar’s memory, especially his aural ability to remember most things he listened to, and his sharp discernment and critical abilities. He remembered what was read to him, choosing of his own accord the books he wanted read. His memory in particular helped him decide the books he wanted translated and the paintings that were to serve as accompaniment. The Ain-i-Akbari mentions that Akbar would have books read out to him every evening. He chose readers and those who called out the daily prayers, especially for their pleasant voices. Bada’uni, the temperamental writer and historian who constantly competed with Abu al Fazl for Akbar’s attention, wrote that his appointment as one of the emperor’s chosen readers followed precisely because his voice had the “sweetness and the ravishing tones of a parrot”. Readers would be paid according to the number of leaves they had read, as indicated by jottings, some made by the emperor himself, on the book’s very last leaf. In her book Art of Memory, Frances Yates has mentioned memory-enhancing techniques in use in ancient Europe; such mnemonics for instance imagined a certain place in the mind to store things to be remembered. While such a study hasn’t been done in the South Asian context, developing memory was an important component of the early education system, and it wasn’t just rote learning as such systems have been conveniently dismissed. Universities in ancient India practiced and taught memory techniques. The criteria for actors as cited by the Natyashastra, included the possession of a good memory; travelling minstrels and bards needed one too, as they added to the stories in their repertoire. And while there were scribes to maintain records, officials and nobles were expected to have good memories. Akbar’s love for books also led him to devote time to the collection of books in his library – one he inherited from his father and expanded substantially at Fatehpur Sikri. Libraries did exist in India despite the oral tradition of learning. Xuanchang mentions Harshavardhan’s library, from which the emperor generously gifted him cartloads of books. There are historical references to libraries in Kashmir, Assam, and Pattan in Gujarat. Nalanda’s famous library, the Dharmaganja had three separate buildings: Ratnadadhi, Ratnasagara and Ratnaganjaka. During the sultanate period, the collections of the Sufi saint Nizamuddin Auliya and the Afghan noble Ghazi Khan were accessible to the public. Sultan Mahmud Begada of Gujarat had a library in his palace. In 1472, Mahmud Gawan, the noted vazir in the Bahamani kingdom, sponsored a college and a library with 30,000 books, and these later came to Aurangzeb during his Deccan campaign. 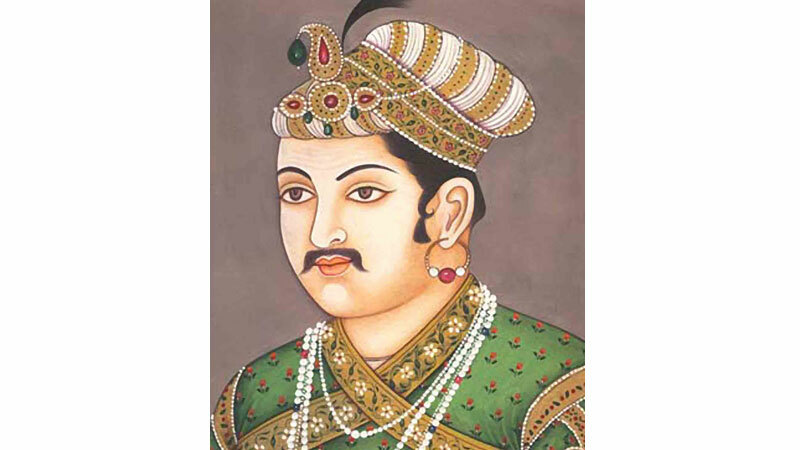 Babur had a short-lived presence in Delhi and Agra, but he did have a library in Delhi, which included books brought from Farghana and ones acquired from India. Humayun set up his own collection in the Sher Mandal in the Purana Qila, actually built by Sher Shah. It was this collection that Akbar expanded, via acquisitions, translations, donations, and also legacies, as when he inherited several hundreds of Faizi’s valuable manuscripts. The imperial library, it is believed, was located in an immense hall on one side of the octagonal tower in the fort, and included even a section in the zenana. Women of the royal household had their own libraries. The tradition began with Gulbadan Begum and apparently continued until the time of Zeb-un-nisa, Aurangzeb’s eldest child and daughter, who was also a poet. Akbar organised the library more systematically; its staff cataloguing and classifying the nearly 24,000 books in it. Vincent Smith in his book on Akbar says that his library had few rivals in the known world. Besides, the head librarian, called the Nazim or Mutamad, and his deputy, there were assistants who entered details of the books into separate registers for each subject, ranging from astronomy, music, astrology, to commentaries on the Koran, theology and the law. Other staff included scribes, calligraphers, book-binders and book-bearers. Manuscripts were encased in silk, bound with lacquer or leather, and richly engraved and inscribed. Books, according to Abu al-Fazl, were even carried during battle, for the army was a mobile camp. Abu al-Fazl mentions some of the works this library contained. Akbar especially took an interest in contemporary historical works, such as the Jama’at Tawarikh, a book on the Turkish Mongolian dynasty. Baburnamah was a favourite. There were two copies of the Khalil wa Dimnah, works by the Persian poet Sa’adi – the Gulistan and the Bustan – and also those of Amir Khusrau, such as the romance Duval Rani Khidr Khan. These were all lavishly illustrated, as was Firdausi’s Shahnamah. A particular favourite of all Mughals was Jalaluddin Rumi’s Mathnawi. Babur’s father had rated it highly, and, later, Dara Shikoh copied extracts from it and Aurangzeb was often moved to tears when it was recited. Akbar’s court also drew writers, and it was he who created the position of poet laureate. Ghazali Meshedi was the first, followed by Faizi. Besides Persian writers, there were also Brajbasha writers, especially in the Mughal court of his successors. The maktabkhana, or translation bureau, was attached to the library, Akbar sourced texts from Sanskrit, Arabic and Turkish and had these translated into Persian, with several copies being made. He picked books out of personal interest and those that he thought would be appreciated and read by many others. Akbar emphasised aspects of clarity and reason rather than convention or even morality. Among the first books he picked was the Hamzanamah, an adventure tale from Persia. In 1574, Bada’uni began work on translating the popular collection, Singhasan Battisi. As he narrates the story, a learned brahmin was first called on to interpret the book. Akbar liked the first leaf Bada’uni translated and the latter went on to complete the book in 1581. The translation of the Mahabharata as Razmnamah began in 1582. The translation method saw a dual process: learned scholars rendered it from Sanskrit into Hindi and then it was rendered into Persian, as was described by Naqib Khan, one of the translators of this work. Akbar had a clear idea of the end objectives and basics regarding translations. As scholars have explained, he was keen on getting to the original meaning of the work and on making it accessible. On one occasion, he upbraided Bada’uni for some “false”, even “bigoted” imputation in his translation of the Mahabharata. Two texts of the Khalil wa Dimnah were sourced and translated, one by Abu al-Fazl and the other, based on the Jain version called Pancakhyana, by Mustafa Khaliqdas Abbasi. As for his own life, Akbar commissioned Abu al-Fazl to write the Akbarnamah. This was heavily illustrated in 1586-87. A new set came up a decade later in 1596-97. Under Akbar, the atelier attached to the kitaabkhana that housed scribes, painters and calligraphers expanded exponentially. In the time of the later Mughals, interest in painting spread to other regional kingdoms and to the provinces, and artists travelled freely, not attached to any particular court. They often also accompanied the king on his long campaigns. It was the Hamzanamah that first Akbar had illustrated lavishly. The book was written on fabric, taking up 19 lines on one side. It had 1400 illustrations on the reverse side, so that the reader could still read while holding up the illustration for the audience to see. The project began in 1558 and dozens of artists worked on it for 15 years. Fewer than 200 folios of the Hamzanamah have survived, some now in the V&A museum. In other artistic firsts in the Mughal period, artists appeared in paintings too, and portraiture especially was a new innovation.